Broken jaws are more common than you might think. This injury is not just reserved for athletes and bar brawlers; the jaw is the tenth most broken bone in the body. Broken jaws are caused by traumatic events. Car accidents, falls, industrial accidents, and sports injuries are common contributors. Because so many broken jaws stem from fights and assaults, it is no surprise that men are nearly three times more likely to suffer a broken jaw than women. Commuted Fracture – The bone is splintered or crushed. Greenstick Fracture – The bone is cracked but not completely broken. Compound Fracture – The bone is broken and penetrates the skin. Simple Fracture – The bone breaks but does not pierce the skin. 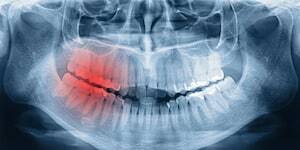 Regardless of the type of fracture, immediate medical attention is necessary when dealing with a broken jaw. All kinds of issues can arise from this injury including breathing difficulty, blocked airway, infection, and tooth misalignment. So the best course of action is to go to the emergency room should you or someone you know breaks their jaw. These are awful injuries, but they are relatively easy to treat. Typical treatment involves painkillers and a liquid diet. Still, more severe fractures can lead to surgery, which usually involves having the jaw wired to a patient’s teeth. This usually entails a six to eight-week diet of only soft foods or liquids. There are not a lot of recorded cases in Maryland where the broken jaw is from a car accident. Miller and Zois had broken jaw cases, but it would be misleading to list them here because the critical injury in those cases was not a broken jaw. That is the problem with looking at car accident verdicts and settlements. Usually, the broken jaw is not the only injury. The assault cases, while an imperfect comparison, isolate just that injury for valuation purposes. Keep in mind that it is impossible to predict how much a judge or jury would award in any broken jaw case. These verdicts are a tool to use in conjunction, with other tools, to help you better understand the possible settlement and verdict range for your case. 2014, Maryland: $100,000 Verdict – A teen is standing on his front porch when someone yells a racial slur at him, prompting him to run. He is tackled by plain-clothes police officers and allegedly thrown into some trashcans. After being released without arrest, the teen suffers immense pain in his jaw. He sues the police department, claiming that the wrongful arrest resulted in a broken jaw. The jury returns a $100,000 verdict for the teen, saying that there was a willful and malicious assault. 2014, Maryland: $75,000 Settlement – A man is arrested for driving drunk and evading a parking lot fee. During the arrest, he claims that police employed unnecessary force against him, resulting in a broken jaw. He sued the department, claiming that the officers should not have used the amount of force that they did, and could have avoided the broken jaw. Before trial, both sides agreed to settle for $75,000 provided that they did not have to admit any guilt or liability. 2013, Maryland: $106,639 Settlement – The plaintiff, a minor, attends a party that is unchaperoned and involves underage drinking. At some point during the party, another individual punches him in the face, prompting his mother to take him to the emergency room the following day. After he was diagnosed with a broken jaw (which required two surgeries to treat), he sues the person who assaulted him and the owner of the house where the party was held. They both enter into settlements totaling $106,639. 2012, Pennsylvania: $75,000 Verdict – While riding her bike, the plaintiff is struck by a man making a left turn in his car. The cyclist breaks her jaw, which requires her to have it wired shut for three weeks. During that time, she can only ingest liquid foods. She sues the driver, alleging negligence. The jury agrees and awards her a verdict of $75,000. Broken jaws are painful and can lead to medical bills, emotional pain and suffering. You need the right attorneys to be on your side. The attorneys at Miller & Zois have the tools, expertise, and skill to make sure that you receive that compensation that you deserve from the people that caused your broken jaw. Call 800-553-8082 or get a free online consultation if you have suffered a broken jaw injury in Maryland as the result of the negligence of someone else.